Shkurta’s husband died from a heart attack 6 months ago. He used to work in construction and was very healthy and strong, but suddenly he had an attack that killed him. Shkurta is now left with 6 children. Marigona, the oldest daughter who is 26, is mentally ill and spends most of the time in a room isolated from everyone. There are four other daughters: Ajshe (age 23), Fitore (age 18), Albinona (age 17), and Eriona (age 9). The older daughters do not work as there are zero jobs for women in villages in Kosova. The only son Ardit (age 20) can’t find a job. When we visited them, Shkurta seemed very sad because of the loss of her husband and having to take care of her adult daughter who is not mentally well. Her son was not at home when we visited. The girls were there but they were just so shy that we could not take pictures of them. Shkurta said that many times charities and individuals come to offer help but want them to cry in front of the camera and share their pictures on social media. They do not want that so that’s why the girls won’t come out for pictures. Shkurta’s house is one floor with two bedrooms and a living room. It does not have a functional bathroom or kitchen. 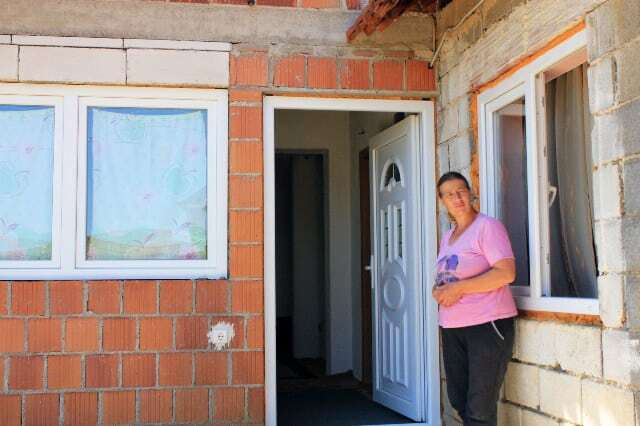 The family receives 60 euro per month in social help, but no help with water or power bills. Assistance from Mercy Projects will be a great blessing to this family. Please pray that they will be open to the Gospel.